The Adventist movement has its roots in the 19th-century “Millerite movement,” which centered on the belief that Jesus would return on October 22, 1844. William Miller (1782-1849) was a farmer who settled in upstate New York after the war of 1812. He was originally a Deist, but after much private Bible study, Miller converted to Christianity and became a Baptist. He was convinced that the Bible contained coded information about the end of the world and the Second Coming of Jesus. In 1836, he published the book Evidences from Scripture and History of the Second Coming of Christ about the Year 1843. The prediction of the year 1843 was based in large part on Daniel 8:14: “And he said onto me, unto 2,300 days, then shall the sanctuary be cleansed.” Miller believed the “2,300 days” referred to 2,300 years and that the countdown began in 457 BC. 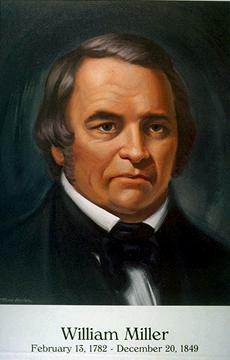 He concluded that the “cleansing of the sanctuary” (interpreted as the Second Coming) would occur sometime between March 21, 1843 and March 21, 1844. When these dates passed, Samuel Snow, a follower of Miller, interpreted the “tarrying time” referred to in Habakkuk 2:3 as equal to 7 months and 10 days, thus delaying the end time to October 22, 1844. When this date also passed uneventfully, many followers left the movement in what is now termed “The Great Disappointment.” Miller himself gradually withdrew from the leadership of the group and died in 1849.